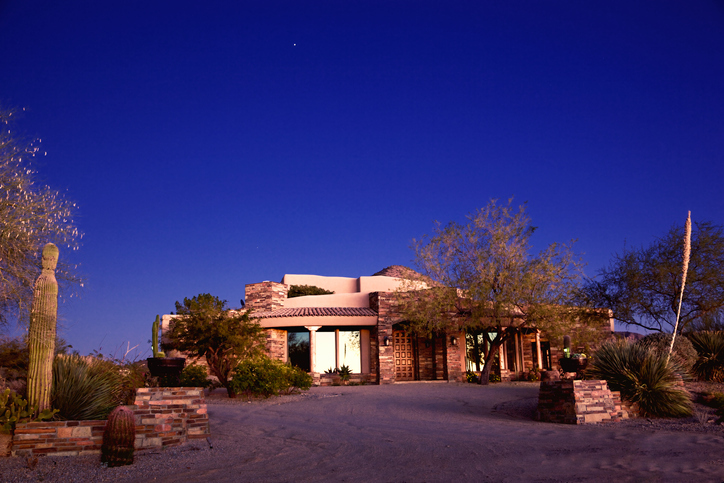 Temperature and light play a vital role in how comfortable your desert home will be. Position your home so that it gets the most sunlight in the winter while still staying cool during the hot summer months. Keep communal rooms like the living room and kitchen on the outer faces of the home to keep the bedrooms cool. Having longer walls facing north and south also ensures that the home receives optimal exposure to sunlight. A great way to control your home’s temperature is by having most of the windows facing north or south. East or west-facing windows take on more direct sunlight, thus making your home susceptible to overheating. It’s also a good idea to have deep eaves or canopies installed by your windows to provide shade. The thickness of your home’s walls and the material you use inside your home can also affect its temperature. Thicker outer walls provide insulation. Flooring components like tiles, concrete or masonry can absorb heat during warmer hours and release it during cooler hours of the day. Some outdoor spaces, given a creative touch and some shade, can double as recreation areas and as key points for your home’s cross ventilation. Water features provide added cooling as well as a style boost. The finish of your home’s exteriors affects its structural integrity as well as its temperature. A light-colored exterior limits your home’s heat absorption, making the inside cooler. Metal panels or other durable materials can act as your home’s protection from extreme weather shifts like sandstorms. Don’t fall prey to boring palettes. When decorating, think of the colors that honor the history and heritage of the Southwest. Think dark greens and maroons as well as light blues, yellows, and turquoise. You’ll want your home to complement the beautiful desert environment without blending too much with the surroundings. Stay true to the desert theme by showcasing native cacti or succulents throughout the home. Place these plants in terracotta pots or some Native American pottery to really give your home that Southwestern charm. The most important thing to remember when designing your desert home is keeping it true to your style. You can do this by adding eye-catching statement artwork on the walls or furniture pieces that encapsulate your taste. You can also add small accessories like throw pillows with animal accents or small sculptures put on shelves or on top of side tables. Want to know more about living in Scottsdale, Phoenix, and the other communities in the area? Explore your real estate options in the region today – give our team at Urban Luxe Real Estate a call at 480.359.6519 or send an email to info(at)urbanluxere(dotted)com.